FRANKFURT -- Robert Bosch said its first-quarter sales rose 5 percent despite a weak Europe and a cooling global economy but warned it may not reach its 2012 growth target due to high raw material costs and the cost of investments in areas such as electromobility and renewable energy. "Economic uncertainties remain high, even if the eurozone debt crisis has relaxed slightly," CEO Franz Fehrenbach said in a statement on Thursday. "With raw material prices remaining high and further investment needed in new business areas, it will be more difficult to reach our target corridor of 7 percent to 8 percent in 2012." Bosch said it expects to see comparatively modest sales growth of between 3 and 5 percent this year. For the 2011 fiscal year, the supplier's sales revenue grew 9 percent to 51.5 billion euros ($68 billion), led by the company's automotive technology unit, the group's largest division, whose sales rose 8.2 percent to 30.4 million euros. Heavy writedowns in its solar energy business caused the company's 2011 earnings before tax to drop by more than a quarter to 2.63 billion euros, leaving its margin at 5.1 percent after 7.4 percent in the previous year. Bosch said it will benefit from growing demand for products that boost fuel efficiency, safety, security, comfort, and convenience in vehicles. By 2014, the supplier aims to boost annual sales of common-rail diesel systems to 9.6 million units from 7.2 million and gasoline direct injection systems from to 8.6 million units from 4 million. Sales revenue per vehicle manufactured globally in 2012 will reach 400 euros, rising further as the market for electric vehicles grows, Bosch said. The supplier invests 400 million euros a year in research on systems for electric vehicles. 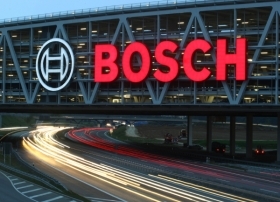 In Europe, Bosch said sales increased by 9.6 percent last year to 30.4 billion euros, led by the German market, which grew 11 percent to 12.0 billion euros. In Asia, Bosch sales rose by 8.9 percent to 12 billion euros, while sales in North America rose by 5.7 percent to 7 billion euros. South American sales for the supplier were up 11 percent to 2.2 billion euros. Volkmar Denner, head of research and engineering, said Bosch will strengthen its software engineering business to take advantage of the opportunities presented by new Internet services, known as Web 3.0. "Up to now, software has generally been embedded in our hardware ... however, technical devices of all kinds will themselves communicate with their environment, via IP interfaces," Denner in Thursday's statement. "Technically, this requires that our products be web-enabled. We are now creating the conditions needed for this." Bosch will more than double employees in its software and systems unit to 1,000 by 2015. Last year, the company increased its total global workforce by 19 percent to just over 300,000. The supplier is acquiring the service Solutions business of the U.S. company SPX Corporation to strengthen its diagnostics business. Denner, 55, will succeed Fehrenbach as CEO on July 1 in a move that makes him only the seventh CEO since Bosch was founded in 1886.